In my life nothing gets planned and this story was not planned either. There I was sitting in front of my computer being hassled by the new kitten and trying to type an article at the same time. It was 3.30 pm when the phone rang. “Do you want to go on a cruise? “ were the first words I heard. “Yes! ” I said,” When?” “Now ! “ was the reply. 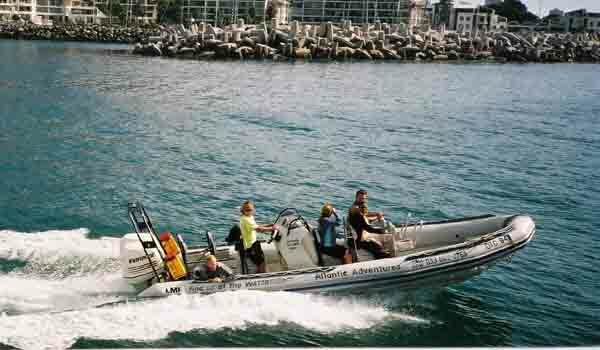 I have lived in Cape Town all my life and have never been to sea in Table Bay. This was my chance and it was going to cost me NOTHING! I grabbed my camera, jumped in the car and drove through to the V & A Waterfront from where the cruise would be leaving at 4.15pm. I made it in 20 minutes, luckily no traffic jams and managed to get some film before I needed to board the boat. Not having been to sea before I wondered whether I would be sea sick. It was so exciting that I clean forgot about that the instant we sailed. At precisely 4.15pm we dropped our moorings and made our way out of the harbour. The Outer Harbour Wall with its warning light. 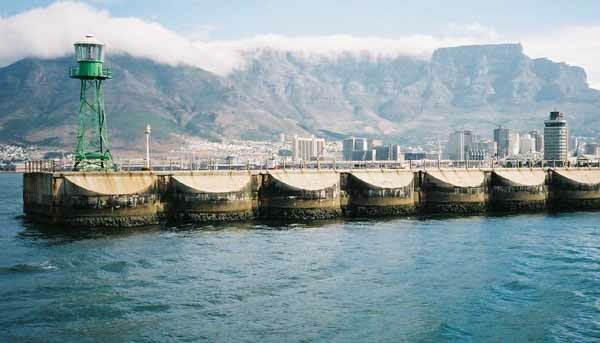 We went through the sea entrance to the V & A Waterfront and then sailed around the end of the outer harbour wall where I have spent many evenings trying to catch fish. The wall looked completely different to what I had imagined it looked like when I was fishing off it. 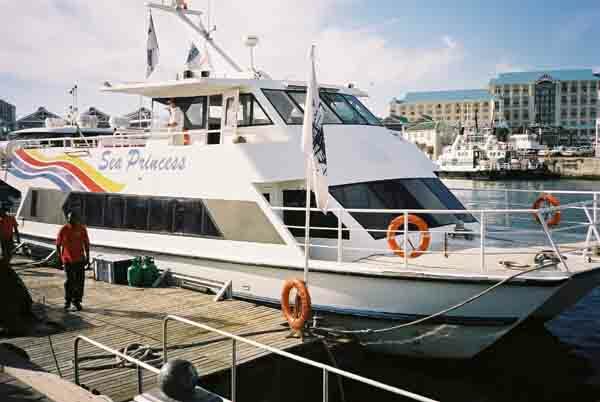 Once we had cleared the harbour the boat picked up speed and we started moving along the coastline towards Granger Bay. I had my camera out and was taking photos like mad. Suddenly next to us was this large rubber duck boat. It was going like mad and overtook us and then stopped in a shower of spray. There was a camera man hanging over the edge taking photos of us. I was to find out later that I was being included in a film shoot for the boat company. On board the rubber duck were a number of very smartly dressed ladies who must have been part of the film crew. They were not having a very good time of it as everytime their boat went over a swell it lifted right out of the water and landed a couple of metres further on in a shower of spray. How the camera man got his photos is a mystery to me as he was being bumped and bounced all over the place as their boat went over the swells. Anyway it was thanks to him that I was having my sea cruise. The scenery along this coastline is quite fantastic. 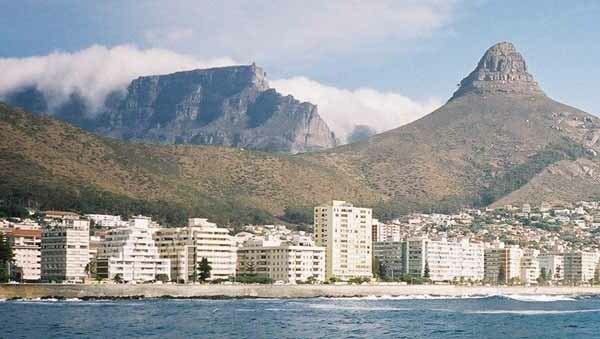 You get to see Signal Hill in the foreground with the rump of the lion extending northwards towards Lion's head. To start with you cannot see Table Mountain and the after a couple of minutes you get to see the north side of the mountain peaking over the rump of Signal Hill. On this day, the wind was blowing and the table cloth was being laid. What a beautiful sight as the mist drops down from the top of the mountain and disappears into thin air as it reaches the lower levels of the mountain. 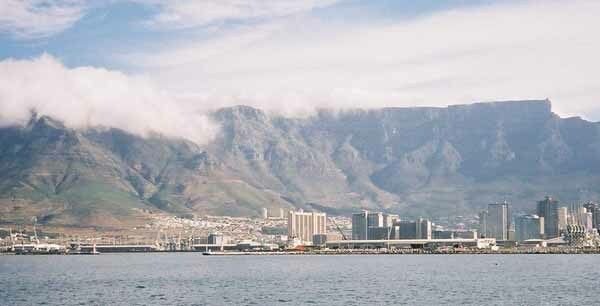 Lion's Head is a peak to the north of Table Mountain and it appears very large as you sail around the coastline. Its quite amazing to see the way it changes as you sail out into the Atlantic. The whole coastline is built up. 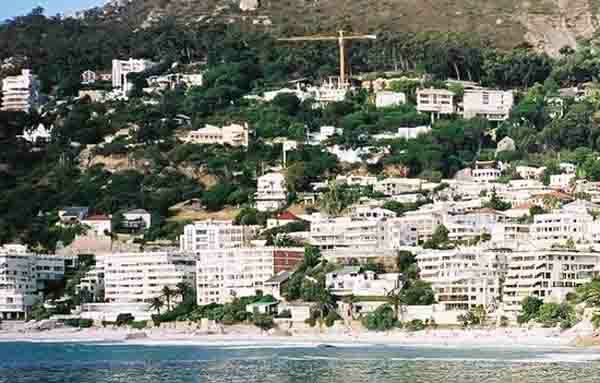 As you round the foot of Lion's Head to the north of Sea Point you come across these mansions and expensive apartments clinging to the cliff faces just above the sea. They are modern and have fantastic views over Table Bay and the Twelve Apostle mountain range to the south. One of them is for sale at present at R45 million.For those who work in dollars divide that by 7.5 to get the dollar value. Once into the Atlantic proper the swells started to lengthen and it was great to feel the power of the sea under the boat. To get the photos however was a job as every time I took aim we went over a swell that I was not expecting and I photographed only half of what I was aiming at. The skipper of the boat had been instructed that the cruise was for an hour so he took us to Clifton to use up the time. Cruising time from the harbour to Clifton is about 20 minutes. We sailed into the bay at Clifton and nearly onto the beach. There are a number of large boulders in the bay at Clifton and the boat navigated between them to get us to within a 100 metres of the beach. 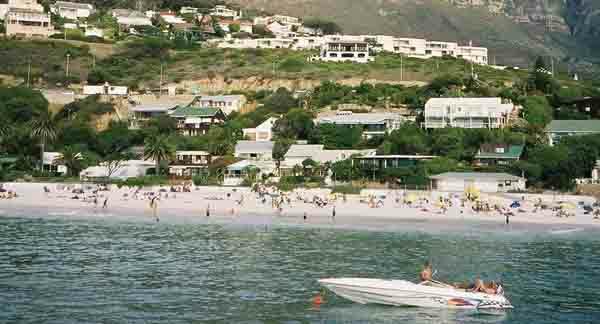 It was fantastic to see these world famous beaches from the sea and actually be cruising where the rich anchor their yachts on weekends to entertain their friends. Everything looks so different from the sea. 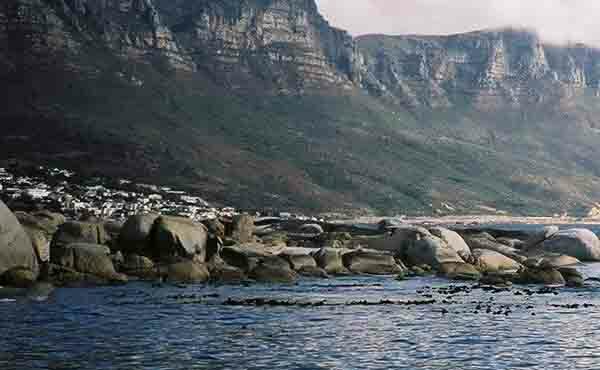 I could just imagine what those Dutch sailors said to each other when they sailed into Cape Town back in the 1600s and discovered this fantastic scenery without all the buildings clinging to the hillsides. Unfortunately it was soon time to return and we left Clifton and at full speed made our way back to the harbour.